By 2500 B.C.E. an ancient people dwelt in the northern parts of Mesopotamia. The Hurrians thrived in the north-central part of Mesopotamia, however, these people also spread to the areas to the immediate east and west. One theory places them migrating from the north, in the Caucus Mountains. However, their origins are not fully known, and this remains a much debated topic. Their native language was unrelated to any neighboring Semitic speaking people. However, they adopted Akkadian cuneiform about 2000 B.C.E., which enabled scholars to read the language. Much remains unknown, however, about the Hurrian native tongue. In the third millennium, the Akkadian Empire founded the town Gasur just east of the Tigris River. Gasur was taken by the Hurrians in the middle part of the second millennium, and they renamed the city Nuzi. Nuzi was a city in the Hurrian kingdom of Arrapha. Arrapha emerged out of the 16th century decline of Babylon. Ithi-Teshup and Ithiya were Arrapha kings during this era. By the mid 1400's B.C.E, Arrapha became a vassal of the Great King of Mari. Nearly a century later the Assyrians would destroy the kingdom of Arrapha. Nuzi was never a major Hurrian city. It was an agricultural town, which now lie buried under the modern day Iraqi city of Kirkuk. To the south of Nuzi was Babylon. 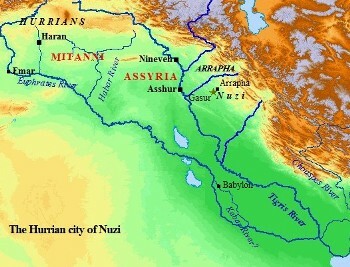 Assyria lie to the west, and the Mittanni kingdom stretched northwest from Nuzi. 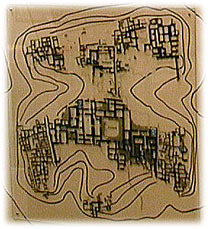 An ancient city map was unearthed at Nuzi, describing the city in detail. This ancient city has produced the most substantial amount of information concerning the Hurrians. Over 5000 tablets have been uncovered at Nuzi. These tablets were discovered in and around the palace, as well as in residential houses. They describe, in great detail, mainly business and legal matters of the day. One quarter of the documents follow the business transactions of a single Nuzi family. "Sill-Kubi, a Habiru, by his own statement into service to Tehiptilla, son of Puhisenni, made himself enter." The Hurrian family of Tehiptilla appear to have been a very wealthy family in Nuzi. In another document, a Habiru women named Tuntukatil, along with her children, entered themselves into this family's service. Similarly, a Habiru man named Atal-Teshup, along with all his household, sold themselves into service. Scholars have claimed these documents more than likely represented contracts of such service agreements. In one informative tablet, the conditions of such agreements are given in depth. "Nan-Teshup, a Habiru, made himself enter into service to Tehiptilla, son of Puhiscenni. If Nan-Teshup should infringe the agreement and leave the house of Tehiptilla he must compensate Tehiptilla with a substitute man as able as he." Other like documents talk of compensation made in the form of gold and silver. The conditions of these agreements seem to have varied, as each was perhaps specific to the individual Habiru's state of affairs. Service conditions, too, seemed to have differed. Some contracts depicted brutal and cruel treatments. "Sin-balti, a Habiru woman, made hersself enter as a maid-servant into the house of Tehiptilla. If Sin-balti should infringe the agreement and go into another house Tehiptilla may put out both eyes of Sin-balti and sell her for a price." Scholars have pointed out the similarities between the above conditions, and those concerning similar situations in the Code of Hammurabi. Slaves found attempting to break service conditions were blinded, then sold. Of course, nobody wants a blind slave, thus, the terms were meant to prevent such actions. One document tells the story of a Habiru man named Mar-Ishtar, from Akkad. Mar-Ishtar sold his son, Zilgenuri into service. The conditions stipulated ten slaves must be provided in order to withdraw Zilgenuri from this service. Though this was more than likely improbable for Mar-Ishtar, it nonetheless was an option out of the agreement. Thus, these contracts were not slavery contracts, in the sense of permanent enslavement. These contracts were indeed labor contracts. Service was rendered, and in many documents, called for the provision of food, shelter, and clothing upon entrance into such services. Apparently, some of the Habiru groups had fallen on especially hard times, and it became necessary to become as domestic mercenaries, selling their services for food, shelter, and clothing. It is clear the Hurrians treat the Habiru separately from slaves. They are not perceived in a negative way by the Nuzi texts whatsoever. This would seem to fit the trend of displaced people attempting to make a living by any means necessary, in order to establish themselves back into society. It would seem more than probable, based on the assimilation of various sources, that many Habiru perhaps bought their independence, thus, reintegrated themselves back into society. These contracts are identical in nature to the contracts Joseph used to sell the Hebrews into the service of the Egyptians, in exchange for food and other needs. In these contracts, terms were provided for the Hebrews to purchase their freedom from the agreement. Nadav Na'aman points to a remarkable similarity between the condition of the "Hebrews" mentioned in the Old Testament. 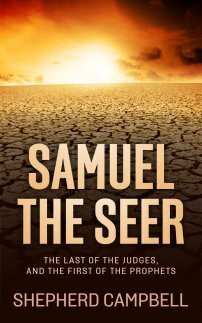 He makes the point that nearly all references to Hebrews in the Old Testament parallel the condition of the Habiru during the second millennium. In fact, many scholars have pointed out the similarity of the Habiru in these documents and the Old Testament Hebrew. Both peoples are often seen in times of hardship. The marked difference being, Habiru is a social designation of a mixed ethnicity, whereas, Hebrew is an ethnic term, reserved strictly for the use of Israelites fallen upon hard times. In any case, the Hurrians treated the Habiru as an important part of society, though still on the fringes in many cases. We can date these documents rather precisely because the ruins at Nuzi correspond with Arrapha being destroyed in the fifteenth century by the Assyrian Empire. It is clear the Hurrian kingdom employed Habiru, oftentimes in domestic service. The Nuzi tablets also demonstrate the Habiru were not thought of as an unwanted element of society. These people simply become one more civilization the Habiru encountered, and integrated themselves into in some fashion. These people were remarkably adaptive individuals. Share Your Thoughts on the Habiru! Have you studied the ancient Hurrians? What is your take on the identity of the Habiru? Click on the link above to share with us your insight, thoughts, comments, and questions!